Juana O. Watson, President of Eye2theWorld’s Board, is also Professor of Latino Affairs with the Graduate Theological Foundation, an adjunct of Oxford University.Born in Calnali, Hidalgo, Mexico, Dr. Watson arrived in Indiana in 1978 and, while furthering her education, worked to educate non-Latinos about Latino issues. She has founded two Latino/Hispanic community centers and the non-profit organization Badges Without Borders (Placas Sin Fronteras) which provides public safety personnel with education in the Spanish language and cultural and diversity training in order to increase the quality of service to communities in Indiana.Dr. Watson holds the Master of Arts in Latin American and Caribbean Studies with a Latino Studies concentration from Indiana University. 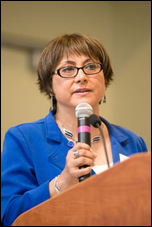 In 2005, she was requested by Indiana Governor Mitch Daniels to serve as Senior Advisor for Latino Affairs in the Office of the Governor, a position she occupied as Senior Advisor for Latino, Immigrant, ethnic and International Affairs until late 2008. Her responsibilities in this position included, but were not limited to, advising the governor on Latino Affairs, providing counsel to the governor on policy issues related to the Hispanic community and visiting various communities and organizations to better represent the interests of the Latino community of Indiana.Prior to her position with the Daniels administration, she was appointed by both Indiana Governor O’Bannon and Indiana State Senator Garton to the Indiana Commission on Hispanic and Latino Affairs. Dr. Watson has also served in the capacity of Advisor to President Vicente Fox Quesada of Mexico as a representative of Mexican immigrants of Indiana, Ohio and Kentucky. In 2008, she earned the Doctor of Education from the Graduate Theological Foundation. In 2009 Dr. Watson was recognized by the Indiana Women’s Commission as one of six outstanding women in Indiana. In 2010 Dr. Watson, was recognized by Girls, Inc. of Indianapolis as one of four female leaders considered role models for young women everywhere. She exemplifies leadership as founder of Badges Without Borders, which educates public safety personnel in the Spanish language and culture to improve their services to the Latino community. She also founded two Latino/Hispanic community centers, co-founded the Indiana Diversity Women’s Network and was senior adviser for Latino and immigrant affairs to Daniels. Dr. Watson also serves as adjunct supervisor for Latino Studies at Marion University, Indianapolis.